The Newark Pilots evened the West Division Finals against the Elmira Pioneers at a game apiece with a 2-1 over the Pioneers in Elmira. The Pilots got on the scoreboard first, scoring a lone run in the top of the third on a Tommy Wagner RBI double that scored Derek Reed after Reed singled to lead off the inning. In the top of the sixth, Logan Boyher led off the inning with a double down the left field line. He came around to score on a double play to make it 2-0 Pilots. Elmira answered with a lone run of its own in the bottom of the inning on a TJ Dixon RBI single that scored Drew Fisher. More damage could have possibly been done, but two Pioneer base runners were picked off in the frame. The run in the sixth would be all that Elmira would be able to muster against Newark starter Jayson Yano. 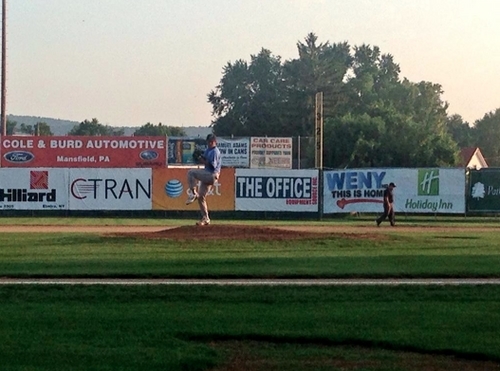 Yano, the 2014 PGCBL Pitcher of the Year, tossed a complete game to pick up the win for the Pilots. Yano struck out four batters, did not walk a man and allowed just three hits. The right-hander tossed five complete games during the regular season and won a PGCBL-high six games. A full recap of his season can be found here. Taylor Ahearn was solid in the loss for Elmira. Ahearn allowed just the two runs over eight innings of work in taking the loss. He struck out three and walked just one. Elmira at Newark 7:05 p.m. The Newark Pilots will host the Elmira Pioneers at Colburn Park for the third and final game in the best-of-three West Division Finals. First pitch is scheduled for 7:05 p.m. Both games of the series have been won by the visiting team. Elmira won Game One in Newark on Saturday night, 8-3, while Newark won 2-1 a night ago in Elmira. This will be the second win-or-go-home game between the two teams in as many seasons. Last year, Newark finished second in the West and Elmira finished third. In the one game playoff in Newark on August 1, 2013, Elmira shutout the Pilots 5-0. The winner of Tuesday night’s game will face the Amsterdam Mohawks. Game One of the PGCBL Championship Series will be Wednesday night in Amsterdam.